In what should come as no surprise to anyone, a new study has found that Aussies kids now spend more time using the internet than watching TV. However, the study, by Roy Morgan Research, wasn’t all bad news for TV bosses. When it came to entertainment and kids, the telly was still king as much of kids’ internet time was done at school or outside the home. According to the research, kids aged six to 13 spend an average of almost 12 hours a week using the internet, almost double the six-and-a-bit hours a week kids spent online in 2008. Including all internet use at home, school or elsewhere, the time spent online has risen consistently over the period, increasing by an average 42 minutes each year. 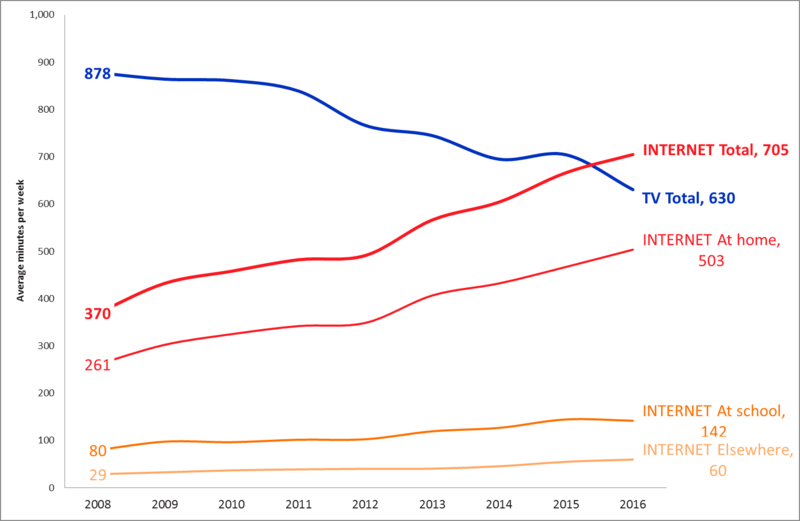 Over the past eight years, rising internet use has taken time away from watching television—and in 2016 overtook it as the more time-consuming media among kids. In 2008, the average Australian youngster spent over 14.5 hours a week in front of the box; by 2016, this had declined to 10.5 hours. At home, kids spend just almost eight and a half hours a week using the internet—still around two hours less than they spend watching TV. Commenting on the study, Roy Morgan CEO Michele Levine said: “As of last year, Aussie kids now spend more time each week using the internet than watching television. “However, not including the hours spent online while at school or out and about, TV remains the more popular medium at home. The trend indicates that it could be a few years yet before kids are spending more of their quality home-time in front of computer (or tablet or mobile) than the television.